Crabs, some people eat them; some people keep them as pets. I feel it's important that people know about some of the biggest and therefore coolest species. First off we have the Mud crab, Scylla serrata native to Australia, and parts of Asia. This big boy can weigh up to 8 pounds (3.6 kg). Next up are red and blue King crabs, Paralithodes camtschaticus and Paralithodes platypus, both species are native to the northern Pacific ocean. These guys can weigh up to 20 pounds (9kg). 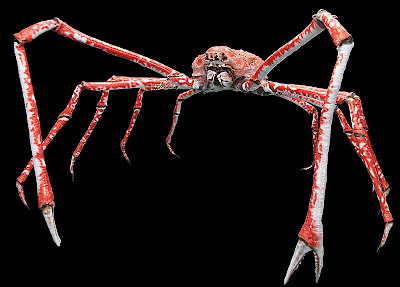 Finally there is the Japanese spider crab Macrocheira kaempferi weighing in at a whopping 40 pounds (18kg).